New offering! 250-3000 Savage- New Hornady brass, Match grade powder, Fed 210M (match) primer, and bullet of your choice. The powder will be loaded consistent to .02 grains, which is accurate to ONE kernel of smokeless gun powder (see video below). Match grade Hodgdon or Alliant powders are used, as well as Federal 210M (match) primers. Ammunition is loaded single stage by hand and the powder charge is trickled up to within .02 grains consistency (about 1 kernel of powder). Please see our video below on how we load our ammunition and how consistent the .02 grain powder charge really is! 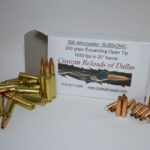 Priced per 100 rounds! 1:10″ twist needed for the 100 grain bullets. If you have a 1:14″ twist barrel, the 100 grain bullets are NOT stable and should not be used. With a 1:14″ twist, the 87 grain bullet is marginally stable. If you have a 1:14″ barrel twist, I would recommend a lighter bullet, like the Sierra 75 grain HP. This bullet is fully stable in a 1:14″ twist. Priced per 100 rounds! Ammunition will be loaded once an order has been placed. Time frame should be 2-5 days lead time. Want another bullet? Call us for pricing and availability! © 2017 Custom Reloads of Dallas - Site by: KR Designs Co.